← Engrish of the Week! Eat…fresh? Friday passed, and then another. Finally, with only a few days left in the month, it was true. The Idaho Burger was here. The Idaho Burger is the newest burger in McDonald’s Big America 2 series. You might remember the disastrous Texas2 from a few weeks ago, reviewed here. Well, now it’s the great potato state’s turn. Is it as terrible as it’s predecessor, or delicious and delightful? It’s fan-freaking-tastic, I’m happy to say. At first bite I was worried it might be a bit too bland, but a few bites in and it was a winner. A few more bites and I wanted to die, but that was to be expected–it’s the heftiest of the Big America 2 series, clocking in at over 700 calories. I felt a bit sick after finishing it, and now I feel oddly hungry just a few hours later–complex carbohydrates, these are not. But, damn, was it tasty! First up is the onion bun. Sadly, I didn’t really notice the bun much, though I usually love onion bread. Maybe I’ll have to get another one to try the bread again! The anchor of the burger is the patty, of course, which is quite big, but not really the point here. There’s bacon, cheese, and fresh onions–apparently Idaho is famous for fresh onions too? Who knew? The leading attraction here is the Hash Browns, just like the ones sitting next to your McMuffin in the morning. At first they worried me with their blandness–I prefer mine with ketchup. Soon, though, the sauces (there’s multiple!) balanced that out, and left a satisfying crunch to go with the meaty burger. It was a bit like putting chips on a Sandwich (Oh, wait, that’s the upcoming Miami Burger. No, really.) The texture of the crispy hash browns was delightful and definitely added something unique to the overall experience. The surprise stars, however, were the sauces. Not one, but two tasty sauces were included on this bad boy. First up is the honey mustard, which is perfectly nice. But hiding under the cheese, on the very bottom, is possibly one of the best sauces to ever come out of Micky D’s. It’s apparently a sweet pepper sauce, but it tasted a bit like caramelized onions to me. Brown, sweet, and a bit earthy, it really made the burger. So the Idaho Burger is a hit, and my front runner for best of the Big America 2 series, so far. The Miami’s got a chance, but the Texas2 still haunts my mouth with sadness. 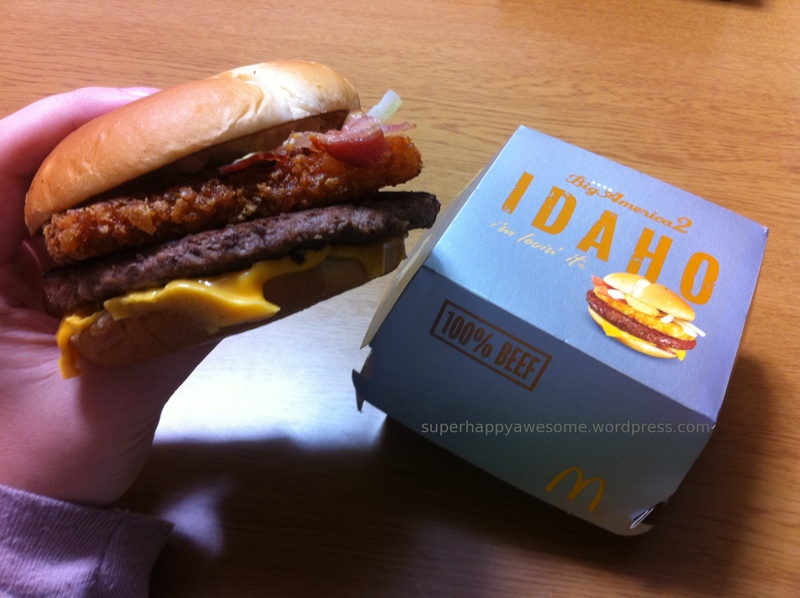 And really, they put a freaking potato on a burger, how hilariously literal of an interpretation of “Idaho” can you get? What do you think, guys? Would you try it? Does it sound good to you, or is it just ridiculous? This entry was posted in Food! and tagged Big America 2, burger, delicious, Idaho, McDonald's, meaty, potato, tasty. Bookmark the permalink. Meat and potato on a bun. Terrific. When are they coming out with a nikujaga burger? Haha, maybe they’ll do a Big Japan series next? 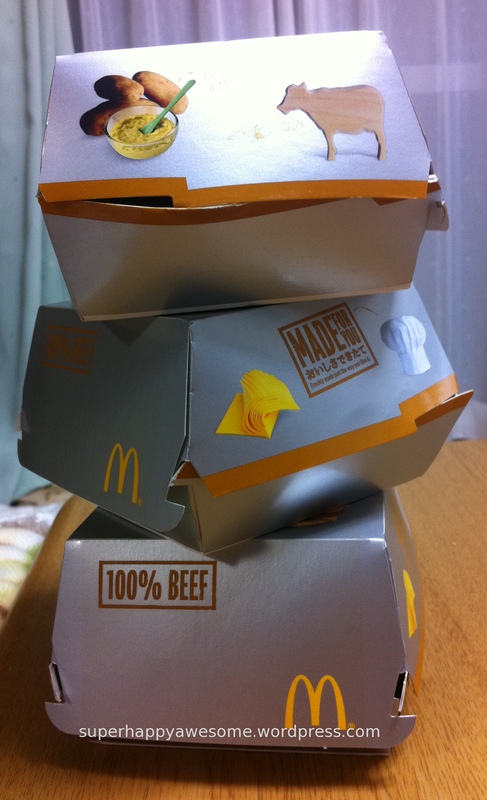 I’d love to see McDonald’s re-imagining Japanese food as burgers! I concur 100%. The Idaho Burger is a win. I’ve already had two of them! But that may be it for a little while, they do sit pretty heavy. Yeah, it sat like a rock, and I definitely felt gross for a while after it. I’ll totally do it again, of course, but maybe I’ll only eat half next time? 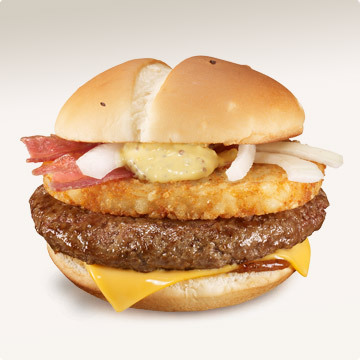 The Hash Browns are reaaaally good on the burger–they add an awesome crunch! They should totally sell them all day. Also, I’m totally going to put hash browns on an egg mcmuffin, lol. Hmm, I can’t think of any off the shelf type analogues..caramalizing some onions is probably not worth the effort to put on a McD’s burger, either! You should totally come! You can be food tourists–try everything from McDonald’s to yummy Japanese foods 🙂 There’s so much tasty here, it’s ridiculous. 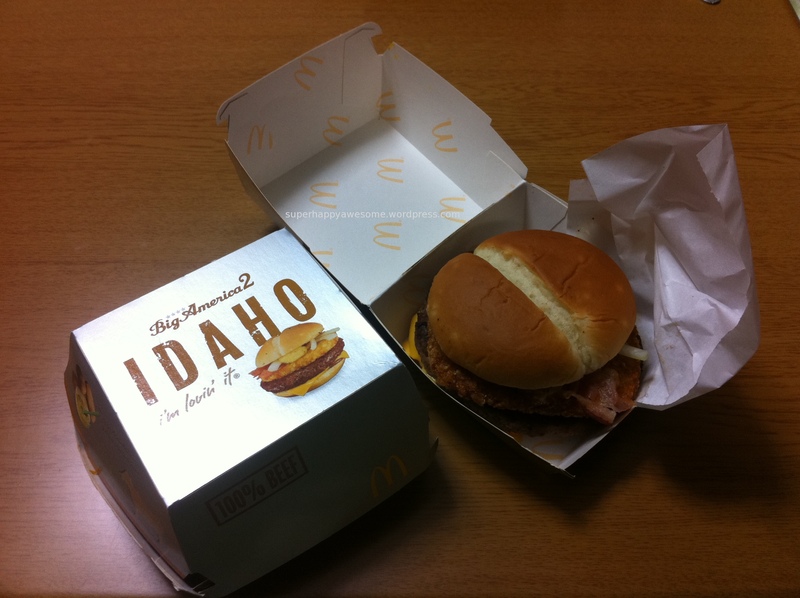 Oh no, am I the only one who didn’t like the mighty Idaho burger? I just found it a little dense, and all I could taste were the raw onions and brown sauce (which was good, but got old quick, at least for me). It’s definitely dense! Mine didn’t really have enough onions, and they skimped on the bacon a bit, but I took that as a misassemble as opposed to representative. I really liked the brown sauce, though! But they had the new Miami Burger, so I tried that – pretty tasty!